Punjab Police, the epitome of strength, valour and supremacy, will now be aided by Police Getaways that quite fit their temperament. Specially built for our North Indian security personnel, Mahindra & Mahindra on Wednesday presented the Punjab Police 150 new Scorpio Getaways. The keys to 30 Scorpio Getaways were handed over to P.S. Gill, Directorate General of Police, Punjab, by Mahindra & Mahindra officials in the presence of Senior Officials of Punjab Police. The event took place at the Punjab Police headquarters in Chandigarh. The remaining 120 vehicles will be delivered soon. Probably one of the finest SUV ever manufactured by an Indian OEM in recent times, these customized Scorpio’s have been tuned specially for the Punjab Police, and is powered by a world-class 2600 cc common-rail diesel engine. The robust and stylish Scorpio Getaway delivers 115 bhp at 3800 rpm and 28.3 kgm torque at 1800 rpm, resulting in greater pulling power, even in lower gears, making it ideally suited for the police force. The Getaways can also be customised with required armoury. Speaking on the occasion, Mr. P.S. 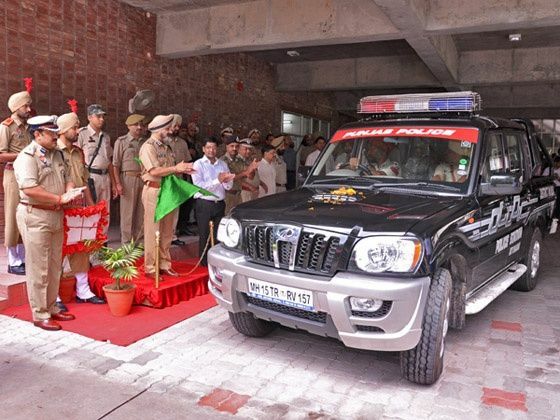 Gill, Director General of Police, Punjab said, "We are all set to induct 150 Mahindra Scorpios, of which 30 have been delivered and rest 120 will be delivered in days to come. We chose M&M Scorpio because it is a multi-utility vehicle, sturdy and durable. We were impressed by the on-road performance of the vehicle." According to Vivek Nayer, Senior Vice President – Marketing, Automotive Division, Mahindra & Mahindra Ltd, said, "We are extremely proud to be associated with the Punjab Police who are known for their reputation in placing duty before self. The unique characteristics of the Scorpio Getaway –ruggedness, power and the inherent ability to conquer all kinds of terrain will find synergies with this brave force." The new Scorpio Getaways have also been built to provide a comfortable ride for the police force. With Power and adjustable steering coming as a standard with this version, our sardar cops will quite enjoy patrolling the streets of Punjab in these robust yet ritzy SUV’s. The Scorpio Getaway boasts a relatively tight turning circle radius of 5.6 meters which makes it easily manoeuvrable. The Getaway utilises ventilated brake discs in front, and drum braking in the rear. If we consider the overall build and off road capabilities of the Getaway it’s not too hard to understand why Mahindra & Mahindra chose the Scorpio over its other SUV/MUV offerings, namely the Bolero and the Xylo for such a noble cause. From acquiring a majority stake in Reva Electric Car Company, to its recent MoU with Korean SUV maker SSangyong Motor Company, this latest move by Mahindra appears to be more of an act of good faith rather than a profit driven business proposition. Share your experiences with Scorpio?